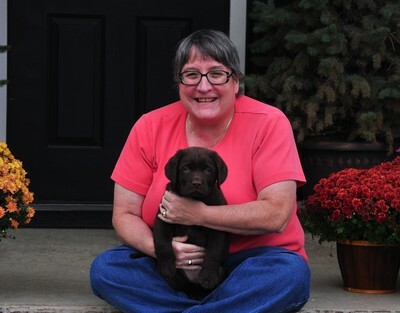 Kelly, I wanted to take a moment to thank you for the love of your labs. 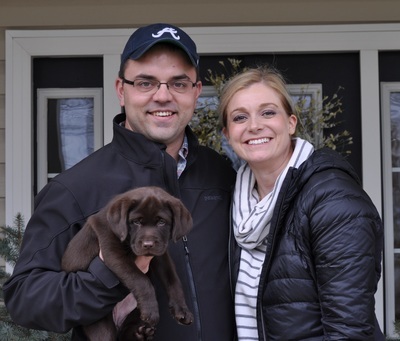 Jen and I got our first boy, Tilghman in February and could not have been happier (or so we thought). Shortly before our pick up date, it was announced that Bliss was expecting a litter we waited for over a year for. I made the decision that if we are happy with one, we'll certainly be happier with two, and you made that dream come true for us. We picked up our second boy, Finnley, in May. From the beginning, these boys have been inseparable no matter where they are in the house, the car, outside, or by our sides. The temperament, disposition, wonderful personalities and all around fun that we have experienced is everything we had hoped for, and more! Since day 1, both these boys came to us well behaved, socialized with people and other dogs. We can't take them anywhere without adding an hour to our trip because everyone wants to pet and look at our boys! Simply put, they are stunning. It is a tribute to you Kelly, as a breeder, to have provided us, as well as all the EML families, the opportunity to have unconditional love of your labradors. 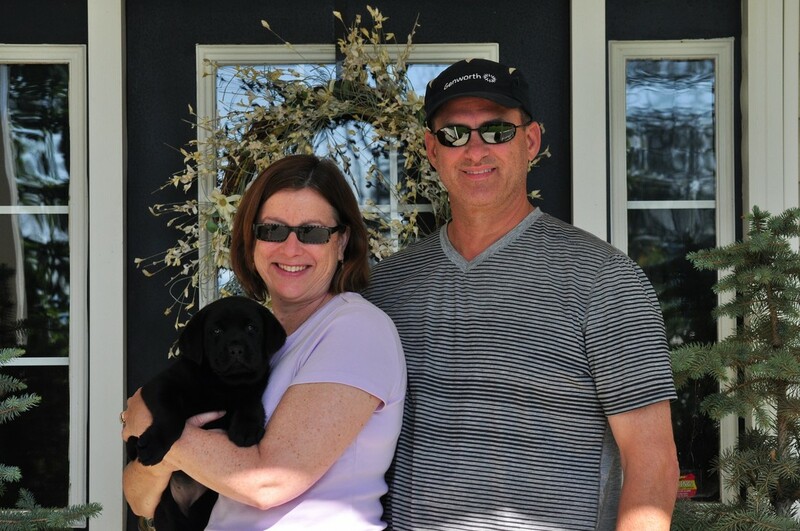 My wife and I are both retired and, after having raised German Shepherds for over 30 years, we decided to get an English lab puppy. 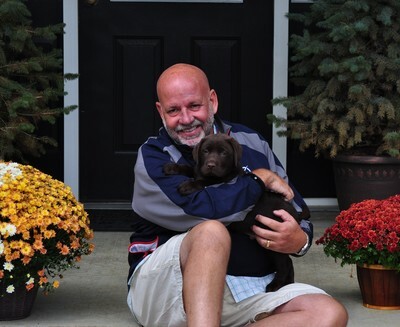 'Ranger', a chocolate lab, is the greatest! 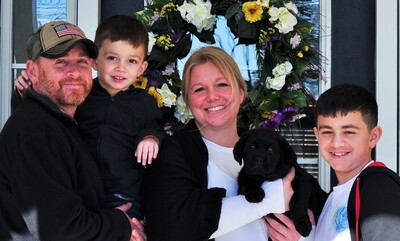 If you are looking for an English lab, look no further than English Mountain Labradors (EML) in Cosby, Tn. Trust me, we looked at quite a few breeders and Kelly at EML is the 'best'. She is very knowledgeable and truly cares about the breed. She was most helpful from the time we first contacted her and submitted our application to the time she delivered our little guy to us. Once you view the EML website and get to know Kelly, there is no question in my mind that you will agree. Simply put, EML has the most gorgeous labs you will find. An English Mountain Lab...where do I start? 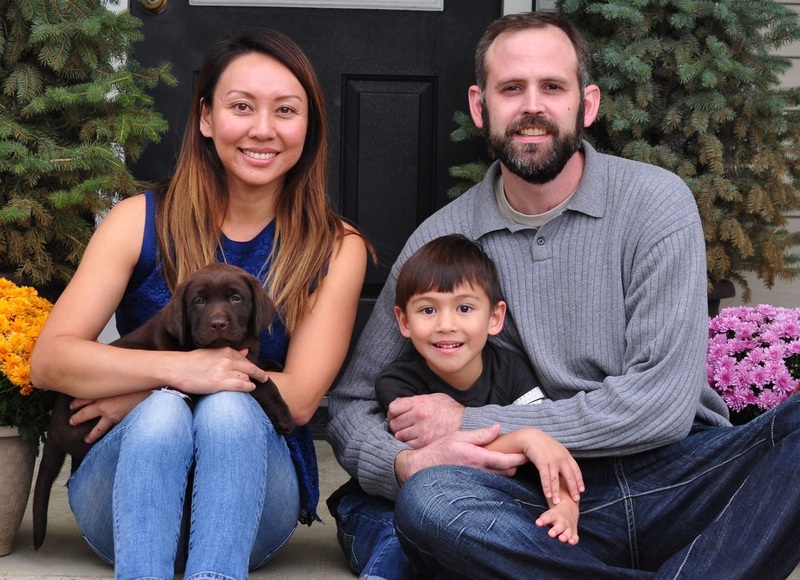 We wanted a chocolate lab and did a lot of research. We fell in love with the strong physique, demeanor, their head and stance. Kelly took great care and consideration in keeping families updated on progress of the puppies growth and their activities. She sent Nursery Notes detailing puppy preparation and posted photos and videos every day in our puppy group. When selecting English Mountain, you are not selecting a dog but a family and community. You have full access to all the EML families for recommendations, guidance, etc. As one of our daughters says about our English Mountain Labrador "She is a vision of beauty and grace" and that's the truth. 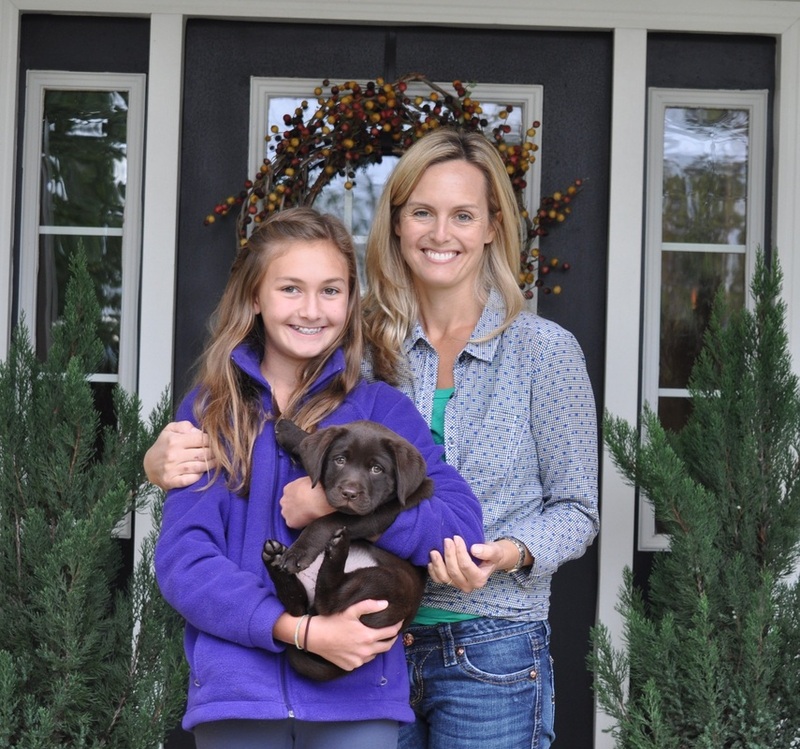 It is the best decision we made putting our faith in Kelly, for Millie and now our second baby, Mia. 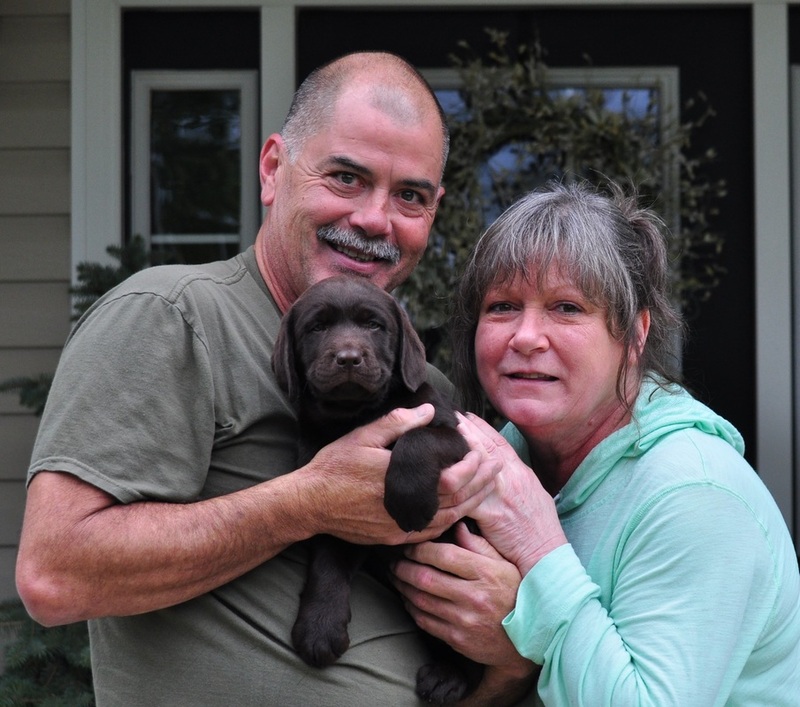 So, when you think of a Labrador Retriever; will just any lab do or do you want the very best? If your answer is the latter, you're on the right web page. 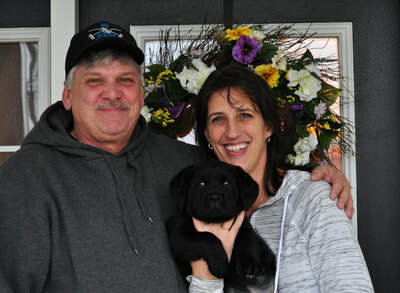 It all begins with the breeder and Kelly is the very best in the business. 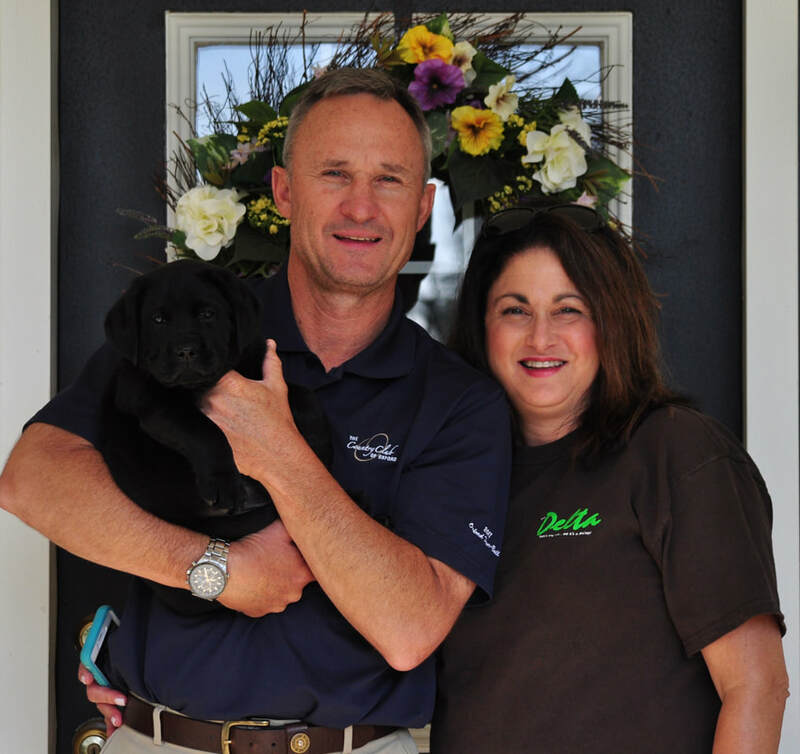 We have a little experience with breeders to make that assessment. 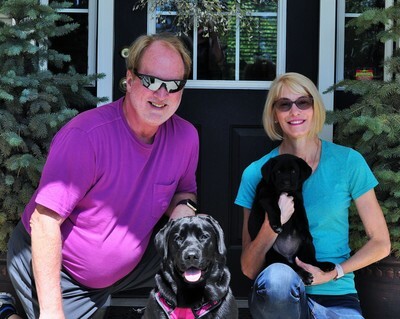 We have had 5 labs in over 38 years of marriage. We have experienced the heartbreak and expense that comes through poor breeding. Kelly's puppies are worth every penny. Our Sassy is the most perfect lab we have ever had. She is more beautiful, healthy and intelligent than any lab we have ever seen. And, she has the sweetest, most loving disposition. We would put her up against any labrador retriever anywhere. And w are not alone in feeling this way. Every English Mountain Labrador owner feels the same about their dog. But understand, Kelly doesn't entrust her puppies to just anyone.. If you are fortunate enough to be chosen to receive one of these 'treasures' you will have hit the lab lottery jackpot! 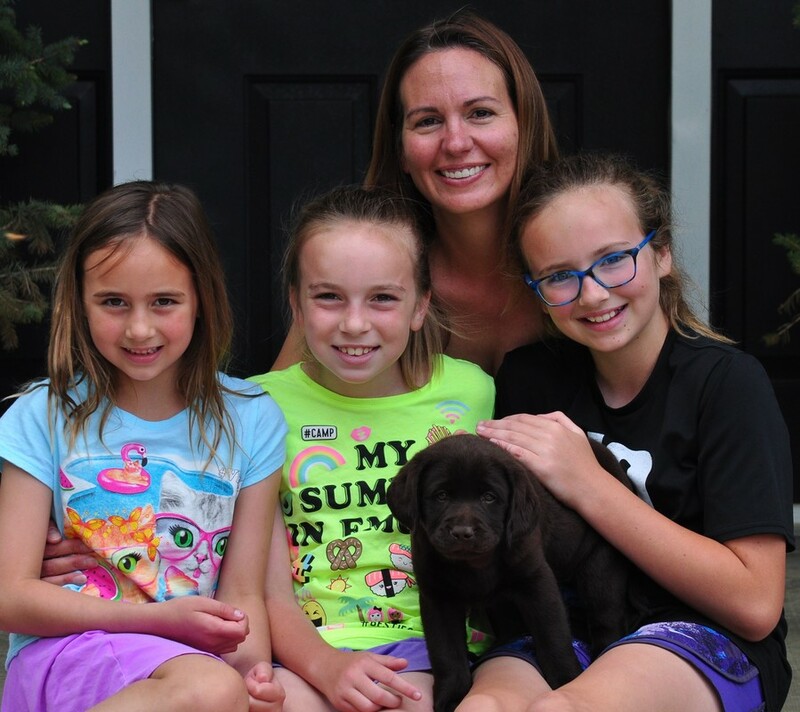 Kelly's puppies are in high demand nationwide. You may have to wait but let us assure you, it'll be worth it. English Mountain Labradors was the BEST choice for a breeder! After moving to Tn from Tx we promised our two boys we could get a labrador puppy. 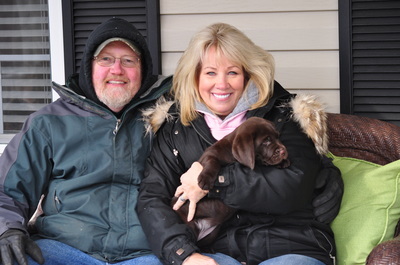 We had previously owned a labrador and knew that was the breed for us. After researching breeders, we instantly knew English Mountain was for us. Their beautiful puppies and adults had won us over at first sight. 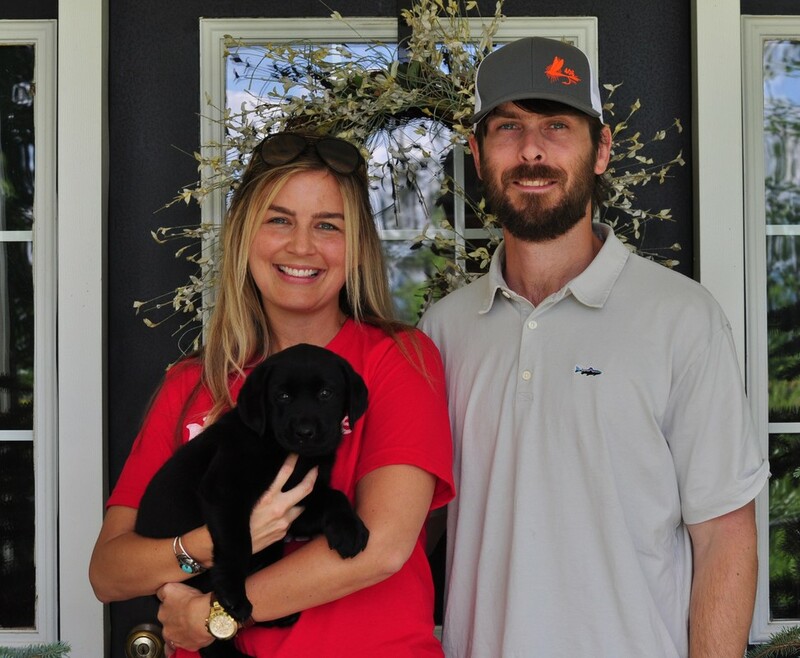 We could tell from the initial application process that Kelly and Jim really care about each and every puppy they bring into this world and their number one priority is placing puppies with loving, caring families. 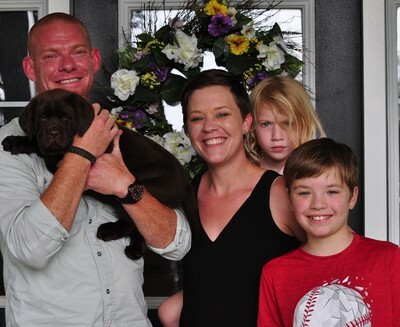 We felt so blessed to be chosen to receive a puppy from them. When our time came and Morsel had her puppies, Kelly kept us up to date on EVERYTHING! It was truly the most amazing experience to be able to follow the growth and development of the puppies week after week through fabulous photos and videos. We loved the anticipation build up to find out which puppy from the litter would be ours. Then we got to meet our Bear, and he was everything and more than we expected. Kelly had everything we needed to get off on the right start with a new puppy. Bear has been a joy since day 1. Thank you Kelly & Jim for EVERYTHING ! English Mountain Labradors, Kelly and Jim Simpson, were a pleasure to work with. We recently received our new chocolate male labrador puppy from Kelly and Jim. From the beginning of our communication with Kelly via email and phone to the day we met DOBBS, we had a wonderful experience. DOBBS is gorgeous, sweet and confident puppy. He has made an amazing addition to our family. We would like to thank Kelly and Jim Simpson of English Mountain Labradors for allowing us to own and raise one of their puppies. 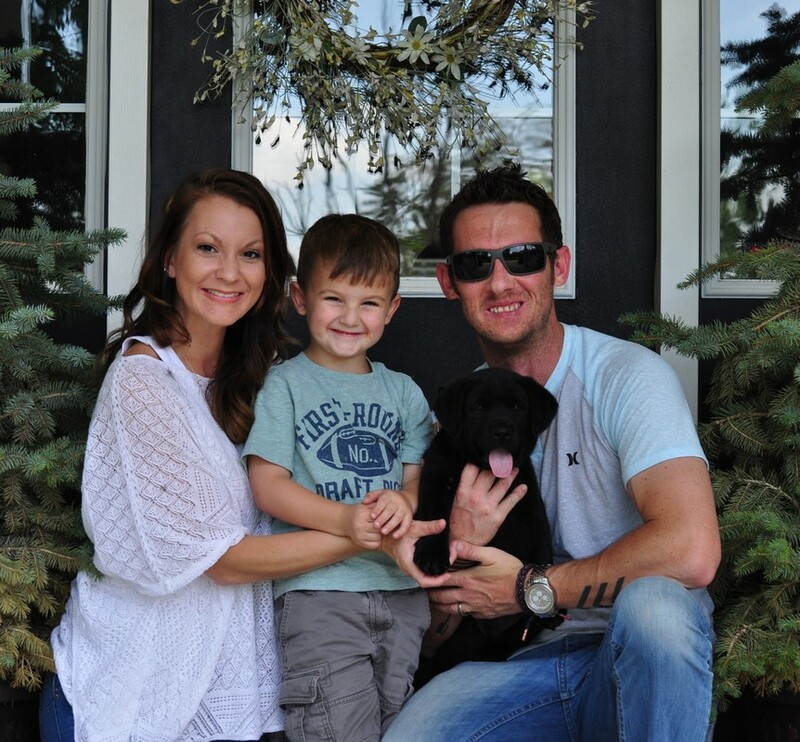 Tommy, Yvonne and Chloe, Tn. Kelly, fondly known as Granny K, is amazing! 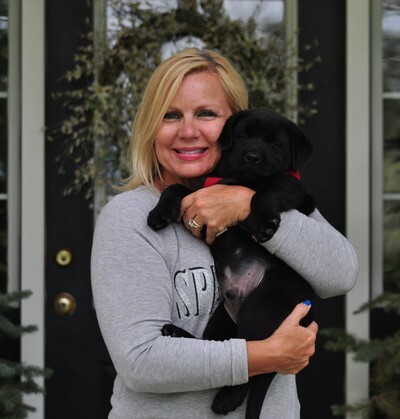 She is passionate about her dogs and the labrador breed. She strives for perfection in the breed and attains it as evident by her beautiful adult labs and puppies. Kelly was exactly what I wanted in a breeder and much more. What stood out to me most was that she sincerely loves her puppies! She will not hesitate to tell you that her puppies health and safety come first and foremost and I respect that attitude. 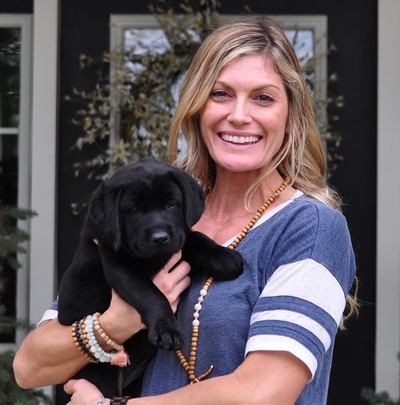 Kelly constantly provided updates about the moms to be, and the puppies, posting numerous pictures and videos on her Facebbok puppy page. If I had a question, Kelly would call me or text me within minutes. 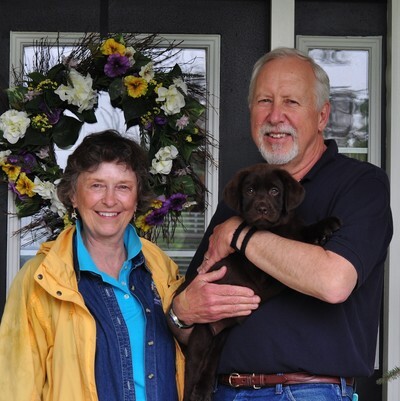 She is responsive, reliable, and well respected as a breeder. In addition, she also has potty trained the puppies and has them on a daily routine. 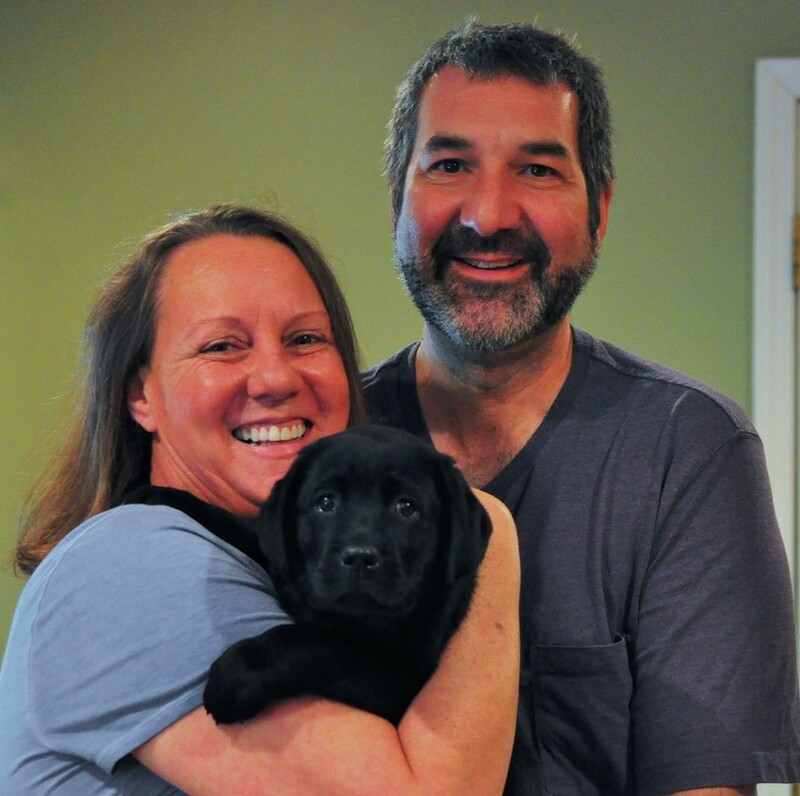 This makes the adjustment period when bringing the puppy home much easier. Neyland is a very adjusted, confident, and socialized. Not only do I have a beautiful chocolate lab, I also found a wonderful friend. Thank you! 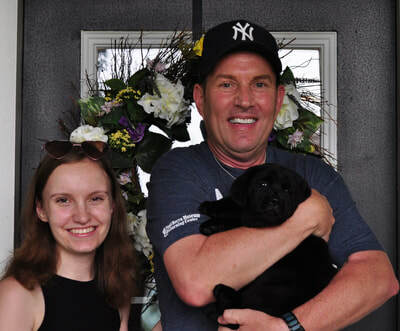 ​We are in such awe of the amazing English Mountain Labradors and their gorgeous labs and dedication to the labrador breed. We were so impressed by the way Kelly commincated with us throughout the entire process/pregnancy and making certain we were happy and had all our questions answered. The love and attention and devotion Kelly showed these beautiful, precious puppies doesn't compare to any other breeder I have researched or came across. Kelly was hands on the entire 8 weeks. She chose the perfect little girl for us. Chloe is the most precious, loving, smartest little girl. We are so happy. She is a little love bug! 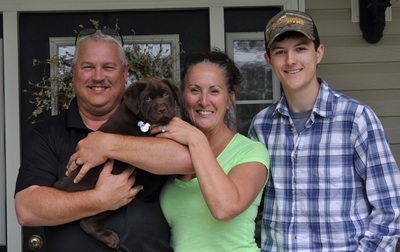 I can't express how honored and blessed I feel to have gotten an English Mountain Labrador. 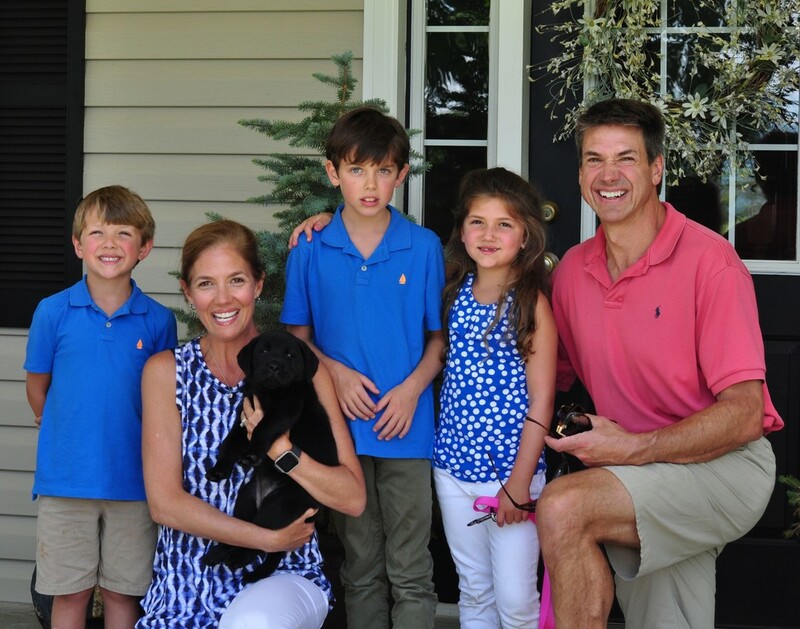 Kelly goes above and beyond to make certain her puppies are happy, healthy and placed with the perfect family. Thank you English Mountain Labradors. We could state the obvious, that your puppies are some of the best looking labradors that we have come across but anyone who has looked around will already notice that. 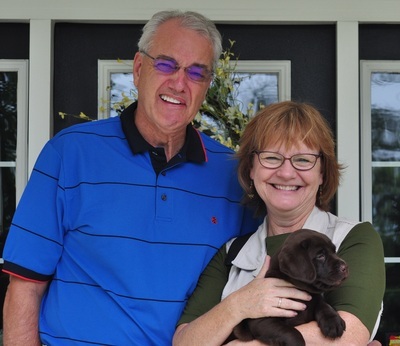 What prospective English Mountain 'Labby' parents will not know is how much you and Jim do to care for the puppies, leading up to that magical day when they are united with their forever families. It is quite amazing! Even then, as if it were not enough to have a beautiful English Mountain puppy that has been cared for like no other, it doesn't stop there. We love the extended family that you have created with all the current English Mountain Labrador families, it is a wonderful network for asking questions, and sharing special moments. THANK YOU! I have grown up with having a dog as far back as I can remember; however, I have never experienced anything like your breeding program. It was such a positive, delightful experience. I can not tell you enough how thankful we are to have found you. I also can not thank you enough for allowing us to become the family you chose for our Bett. We love her to pieces!!! She has all of our hearts!!!!! 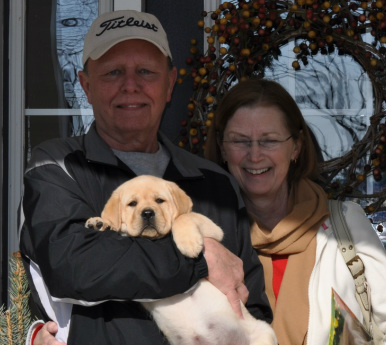 ​When we wanted to get a lab for the family, we searched for the perfect breeder. We searched online and viewed many websites, but the instant we saw English Mountain Labradors we knew this was the breeder for us! All of their dogs and puppies instantly attracted us. They have the most beautiful labs we have ever seen. Kelly has been so amazing through the entire process, and is still there for us if we need anything. You can feel and see the love she has for all her dogs. Lucy is absolutely gorgeous, so smart, so sweet and loving. 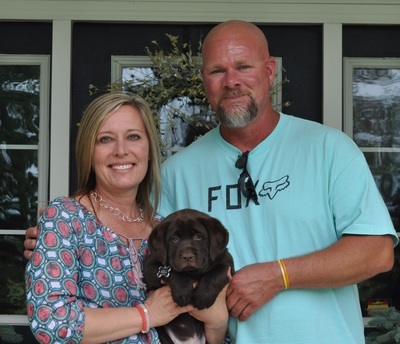 We can never thank Kelly enough for our new family member. 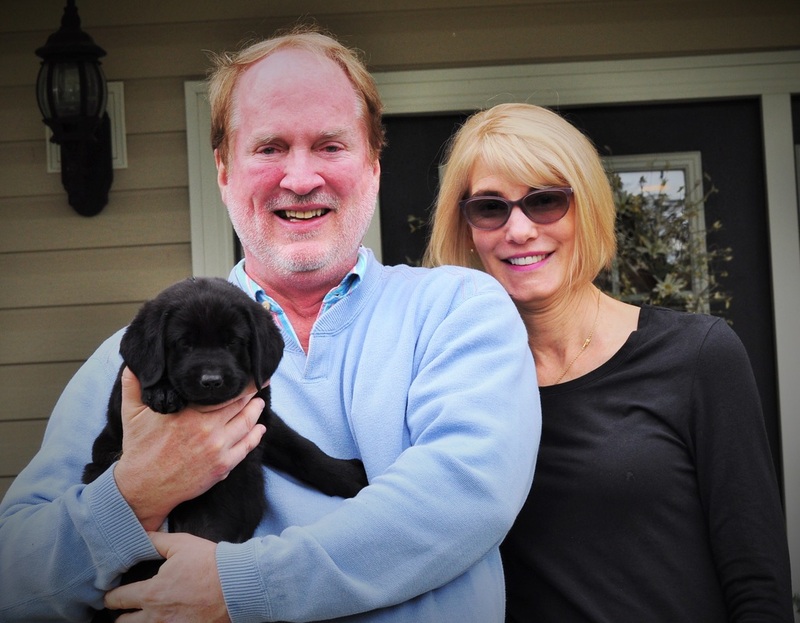 We are truly honored to have a puppy from English Mountain Labradors. English Mountain Labradors is the ONLY way to go! 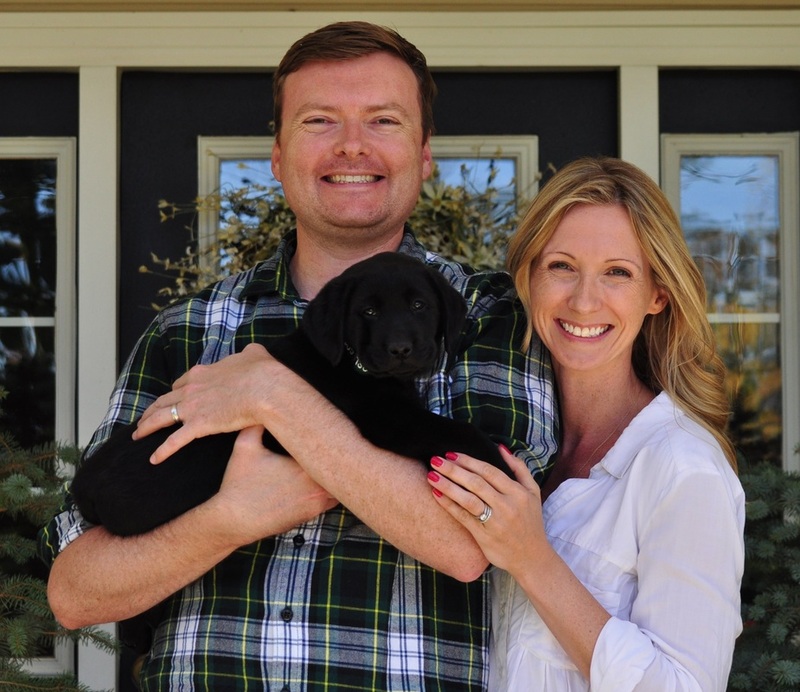 After spending hours, days and months searching for the perfect breeder, I was confident that Kelly was 'the one' after our first conversation. Kelly exceeded all of my expectations! In fact, I cried the moment I arrived to pick up my sweet chocolate chunk. Kimber is everything I could have asked for; wonderful temperament, energetic, smart, loving and STUNNING! I am so blessed to have two new additions to my family, Kimber and Granny K. I highly recommend Kelly, and I know that it is only a matter of time before I have another English Mountain Labrador. 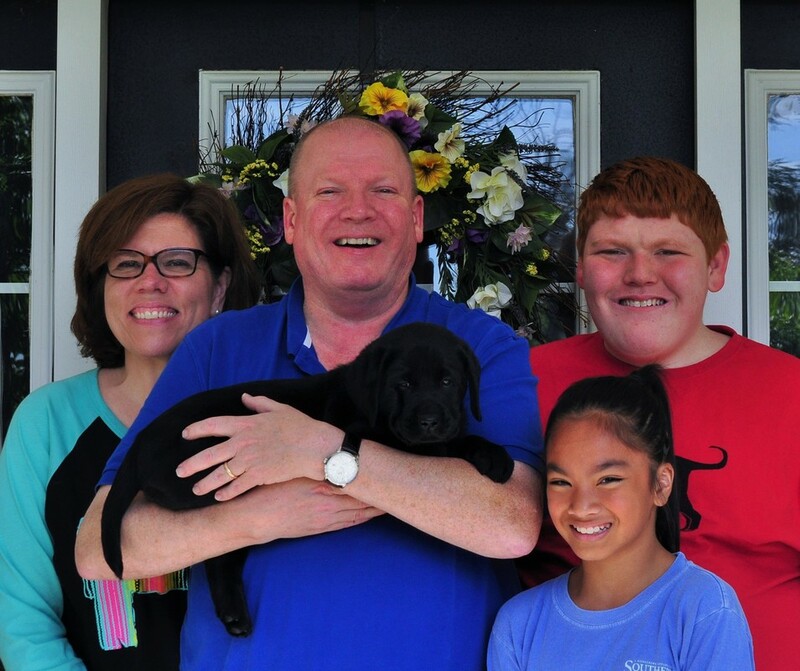 From day one, we were drawn to English Mountain Labradors and knew that our new family member could only be from Kelly and English Mountain Labs. Kelly was upfront, open, and honest with us throughout the entire process. The professionalism, knowledge, and LOVE that Kelly and her family have for their pack, and their newly extended families is hands down, the BEST!!!! !Once Eko was home, we were amazed how he went to the door and sat when he had to go potty, sleeping through the night, etc. Following the care and little details that 'Granny K' gave us to ease the transition. We can't say enough about Eko, his temperament, personality, pedigree. We are so fortunate to have him as a part of our family. 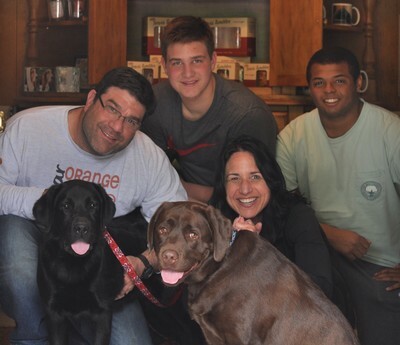 Just the icing to the cake- Eko is so happy to please us and will do anything for us, Just Like A Lab! 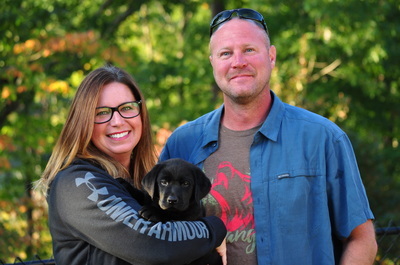 ​From the moment I started dealing with Kelly at English Mountain Labradors, I knew the pups were in the best hands. 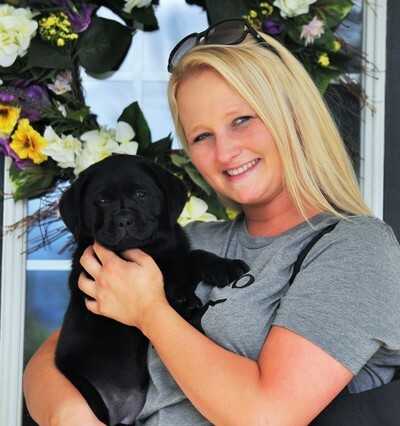 She meticulously maintains her puppy Facebook page for the prospective owners with pictures and videos of the puppies from the day they're born to the day they go home to the new families. She is the definition of professional. On top of this, her training of the dogs at such an early age is phenomenal. I've had my pup for 3 days and shes already potty trained. Oh, and did I mention that the labs are BEAUTIFUL!? I am more than happy with my experience with EML and am looking forward to getting my second puppy in a few months. 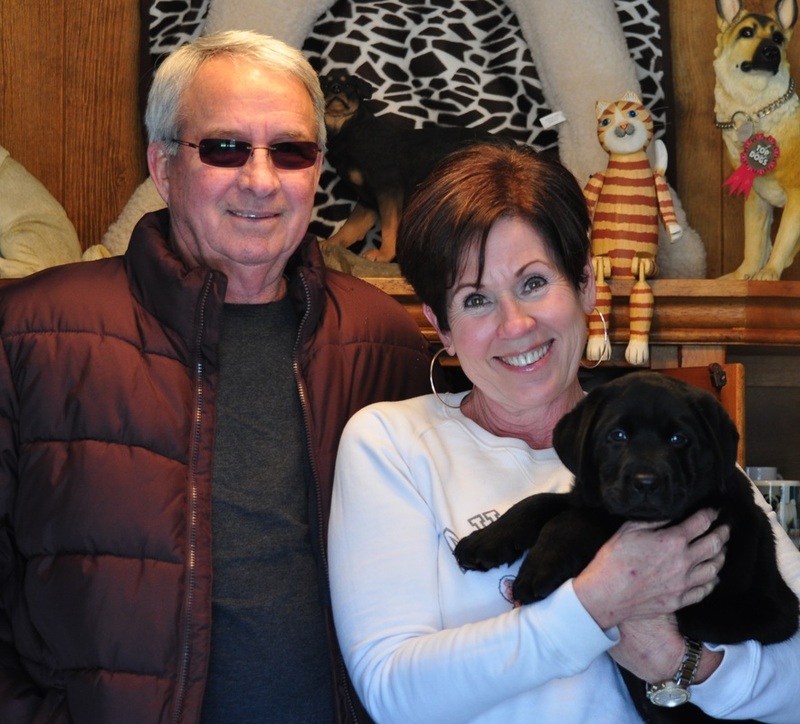 Finding the perfect puppy was made possible by Kelly and Jim Simpson of English Mountain Labradors. Our family's search for a labrador began months prior to finding the website for English Mountain. 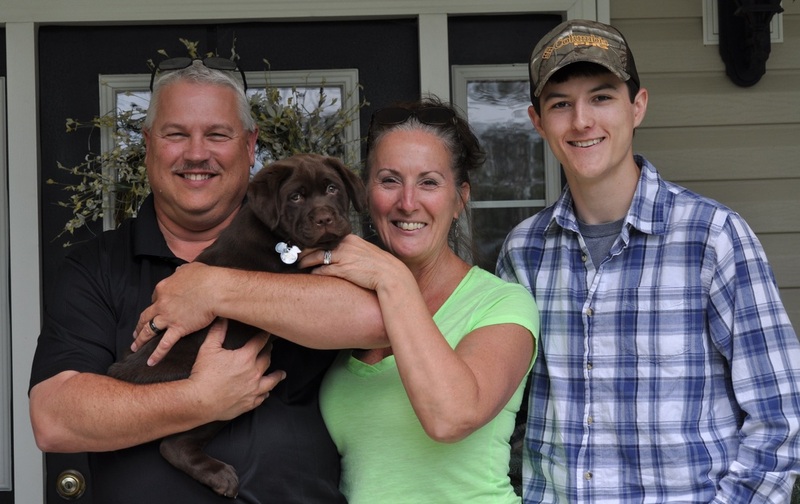 We came across Kelly and Jim and immediately knew that this was the family that we would choose for our new addition, Dixie. 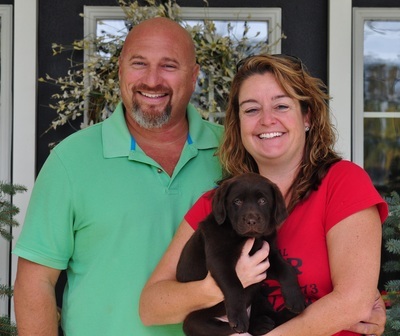 Kelly and Jim are very trusting, caring and knowledgeable. The love they have for each and every one of their dogs and puppies is amazing. We were kept informed and up to date on Dixie prior to picking her up. And to this day, we speak on a regular basis about Dixie and her happiness, her health and well being. They exceeded our expectations. Dixie came home with absolutely no separation anxiety, she was sleeping through the night and potty trained. We will forever be grateful that Kelly and Jim chose us to be a part of their labby family. We absolutely recommend English Mountain to all that are interested in the PERFECT labrador. The perfect puppy for our family....gentle and obedient, that's what we were in search for. We began our search for a breeder who was conscientious, knowledgeable, and who showed a love for her puppies. To be honest, it was her gorgeous dogs that sparked our interest at first, but it was Kelly's attention to detail that made us know we had made the right choice with English Mountain Labradors. From the very beginning, Kelly made a point to get to know our family and stayed in close contact through out the process. We truly feel that she is "grandma" to our precious Sybil. Sybil is the perfect fit for our family...... so gentle with our 4 children, crazy smart, and breathtakingly gorgeous. She has totally lived up to the standard established by English Mountain Labradors. Thank you Kelly for providing an amazing start to our newest love. Words alone can not express the gratitude we feel towards English Mountain Labradors. 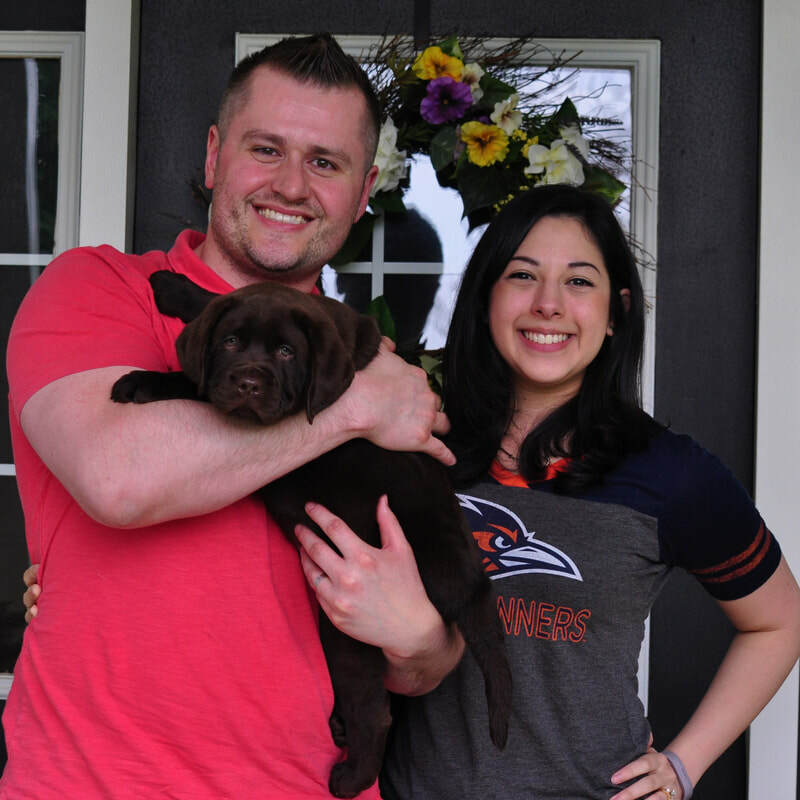 As first time puppy parents, we did extensive research and were drawn to her dogs and outstanding reputation among clients and other breeders. 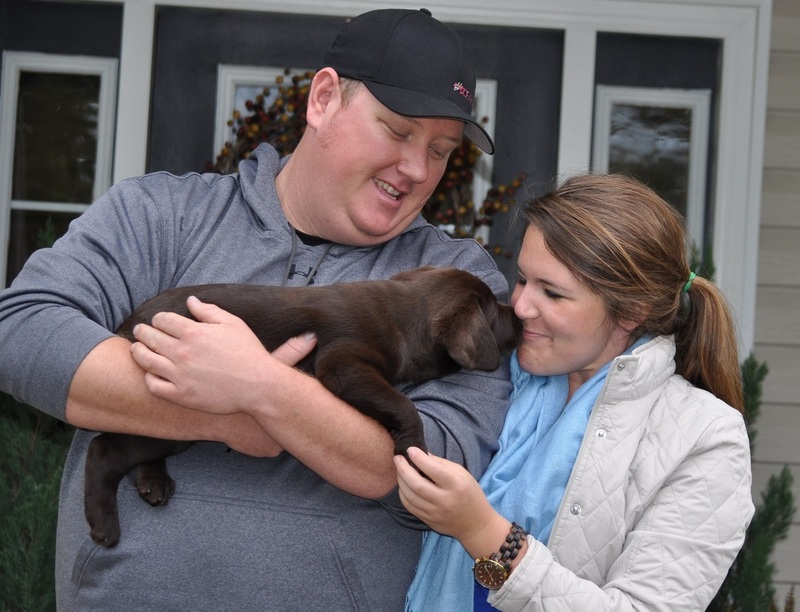 Kelly did whatever it took to ensure that we were bringing home a healthy, beautiful and well adjusted puppy. After we had our puppy home, she was just a phone call away if we needed help or had a question. She is open, honest, and best of all, she loves her dogs with all of her heart. Every aspect of our interaction was personal yet professional. Sailor was essentially potty trained and crate trained from the day we picked her up. The transition was smooth. 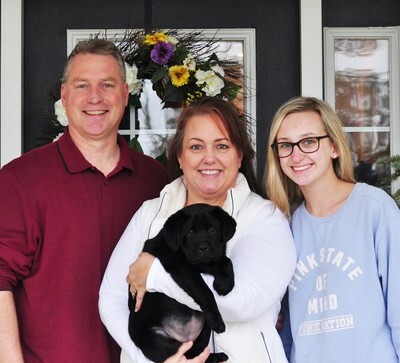 We get compliments on our puppy everywhere we go, and we're always proud to say,"Shes an English Mountain Labrador from Tennessee!" There are not enough words to describe the awesome experience afforded us by English Mountain Labradors. From our first interaction with Kelly, we felt so connected with her; it was almost as if we were old friends. Never too busy to talk and answer all our questions. Kelly kept us posted on the puppies, and kept a close watch on them for their unique personal traits. 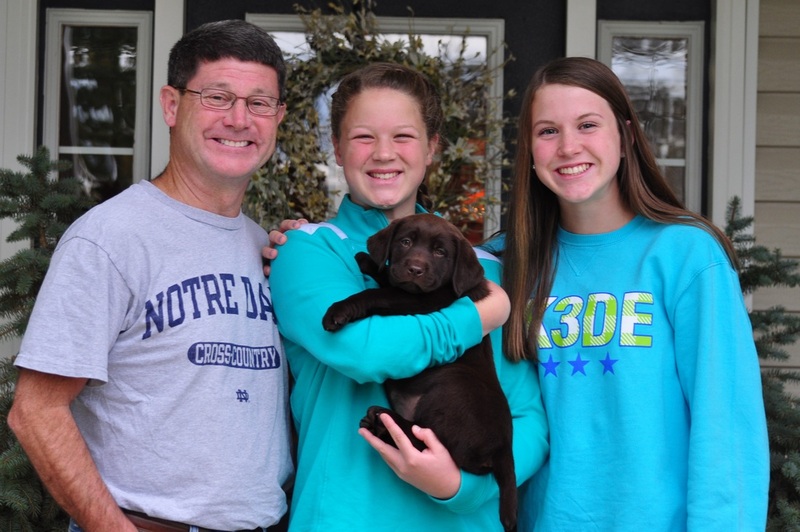 I can tell you she picked the puppy for us!! A true class act in all respects. 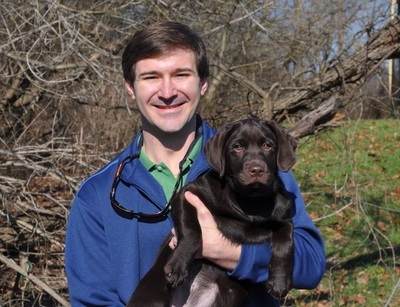 English Mountain Labradors will have my business for the rest of my dog owning years. 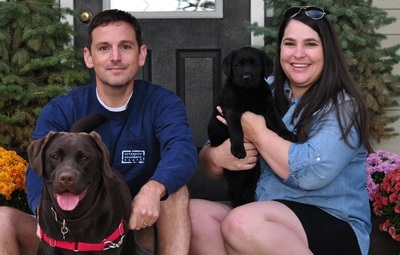 Our experience with English Mountain Labradors was, in one word, outstanding. We had been searching for that special Labrador for quite a while. Frankly, our search was nationwide. We landed on English Mountain Labradors. 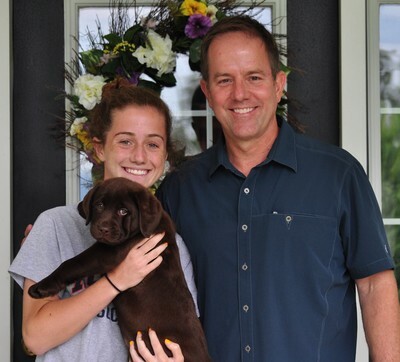 From day one until we picked up Buzz, that decision was constantly rewarded. Great communication, great knowledge, and a great love for the dogs. One look at Kelly's dogs, and you can tell that she is 'functionally' good at her work. These dogs are gorgeous. Not only are these dogs gorgeous, they are healthy, sturdy, and have great temperaments. Take time to talk to her for a while and you'll understand how much she loves her dogs....... that separated her from many. We are thrilled and couldn't recommend Kelly, Jim and the English Mountain team any more enthusiastically. I can not thank you enough for my sweet, precious Hank. This big ole mushy boy is a show stopper. I can't go anywhere without people stopping me to ask about him. He is pretty fabulous! As you know, I did a significant amount of research before selecting a breeder. Your dogs are beautiful. You were always kind and patient and answered all of my 9,698 questions. It is very apparent that this isn't a business for you but it is truly a labor of love. 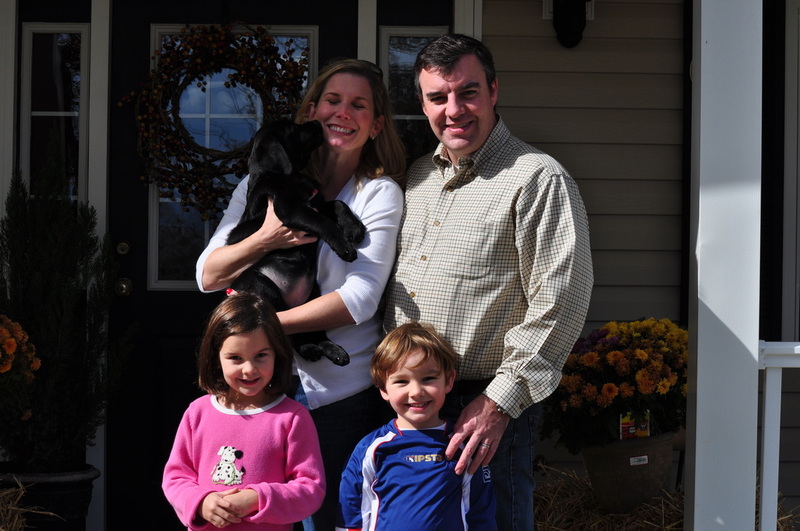 The end result is happy families with exemplary pups that are a shining example of breed conformation and temperament. As a breeder, you exceeded all of my expectations and needless to say I have a pup that exceeded any expectation that I could've ever dreamed of. 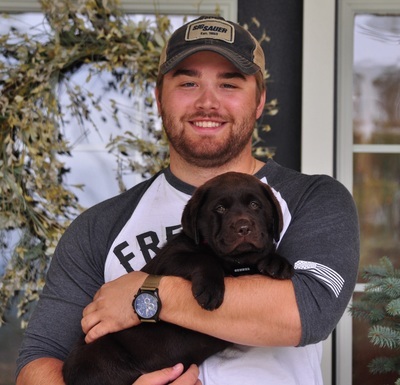 At 8 weeks, he is already socialized, knows basic commands, and is potty training and crate training like a champ. Thank you for your care and attention that gave my little man the best imaginable start. Andrea and Neeley Goodwin, Al. Thank you Kelly for all you did to make purchasing a fabulous puppy from you a wonderful experience! I love that you got to know us and made it a priority to place the best suited puppy with each family! The highlight of each day was starting out the morning looking at the most recent puppy pictures of the litter and watching our little ones grow. I felt like I knew our little guy (Romeo) even before we met. Your communication, knowledge of the breed, and passion are second to none. I am so thankful for little Romeo and the fabulous start he got in life from you. Your puppies all reflect your love for them. 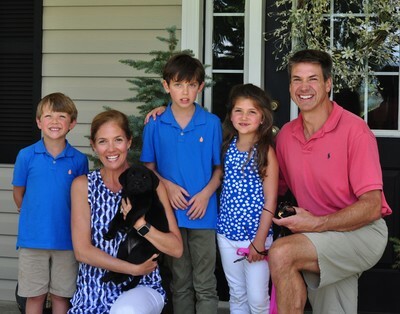 Rob and I wanted to thank your family for picking out a perfect puppy for our family. We were so impressed with how you handle your business. You kept us up to date on the babies progress thru the whole 8 weeks. 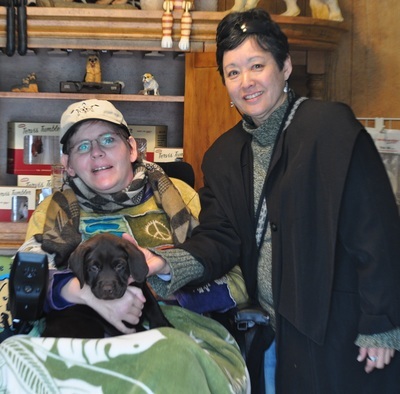 I love the time and consideration you take for a smooth transition for the puppies and the families involved. Your giving us a toy with Raven's scent was perfect for Kodiak's long ride home. He would cuddle with it in the crate and I am sure it made him feel secure. Thank you so much for the tip on classical music...... it definitely relaxes him. He has been a wonderful addition to our whole family. And you were right, he knows how to give as good as he gets. Thank you for everything. Peggy and Rob Burks, Plantation, Fl. We can not say enough about our girl Dixie and our experience with Kelly and English Mountain Labradors. English Mountain Labradors are perfect examples of what an English style Labrador Retriever should be. Working with Kelly from the first day I contacted her has been awesome. Her knowledge and passion for her dogs are incomparable to any other breeder I spoke to while researching who we wanted to get our furry family member from. Even after having Dixie just a few weeks we are constantly stopped and asked about where we got her and how beautiful she is. When we picked her up, Dixie was already crate and potty trained which makes bringing home a new puppy that much better especially with an 8 mo old baby. 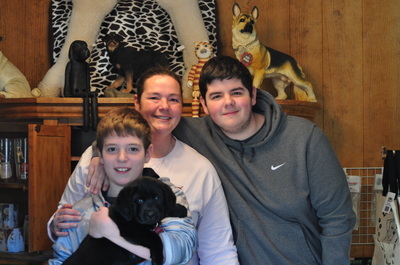 Because of Kelly's love of what she does she started Dixie and her littermates off wonderfully. 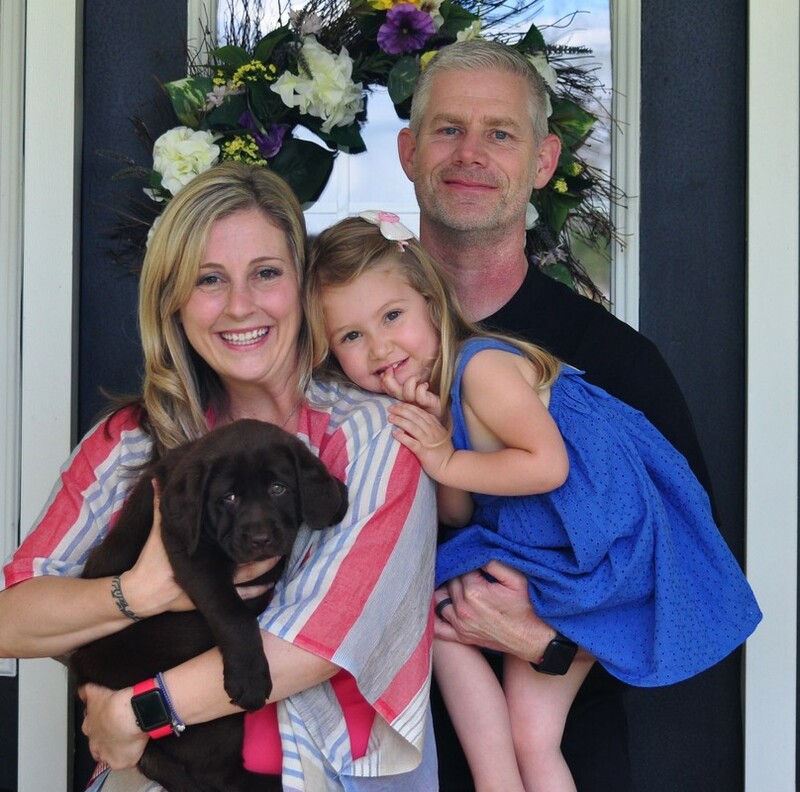 We are so grateful to have met Kelly and thankful of our new girl who will fit in perfectly with our always active family. We have had a great time with Radley. She has slept through the night (following your instructions) from the first day. She is sweet and self-assured and has taken well to training. 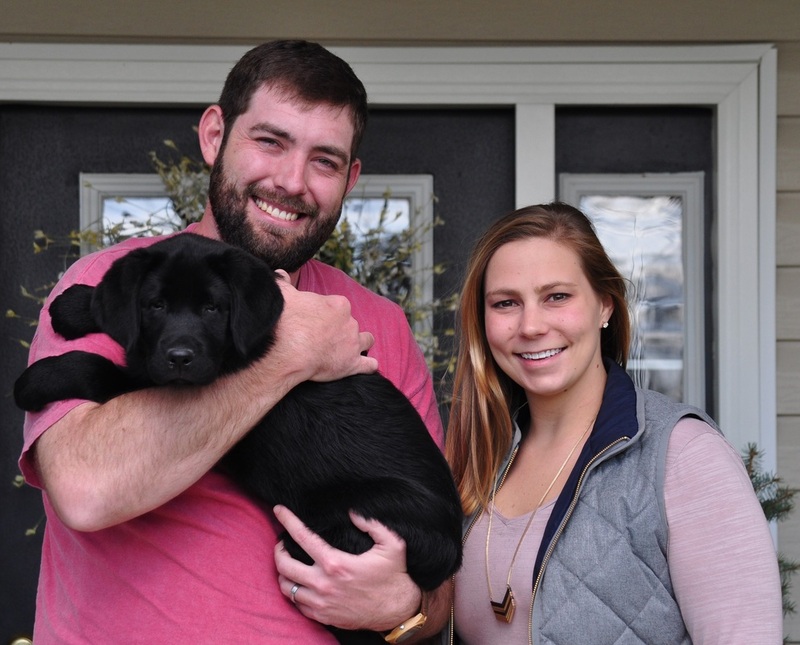 We can't imagine a better addition to our family. The Potts Family Knoxville, Tn. "After viewing your Facebook page, I totally fell in love with all your dogs. 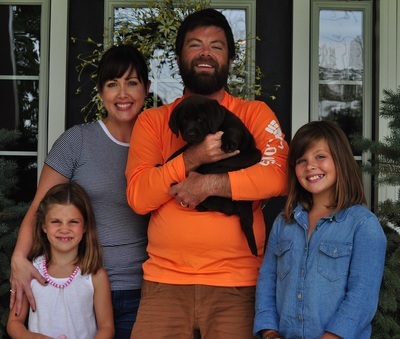 Since we live out of State, it was so much fun for me and my 5 children to watch 'Foley' grow and develop via your daily photos. We fell in love with our new pup before we even met him. 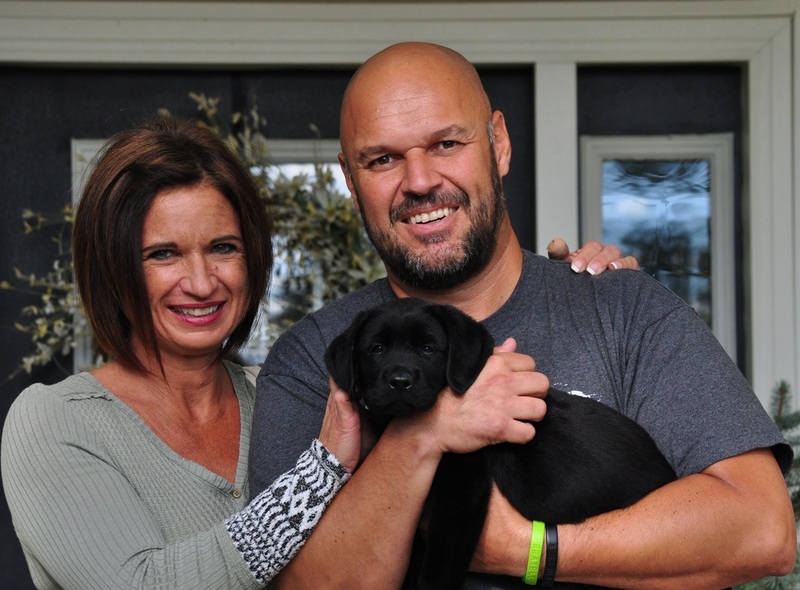 I truly appreciate all of your emails and text messages keeping us up to date on Foley's development, eating, weight, and overall growth and his easy temperament. This is so important to me since I have a large family that also includes another handsome, mature, male, yellow Labrador. When I came to pick up Foley from your beautiful kennel, I was awe struck at how immaculate and professional your grounds are run and kept. Your love and commitment to your dogs is so telling and the proof is in the beautiful, healthy puppies you breed. My kids and Beau ( our big boy lab ) all bonded immediately with Foley. 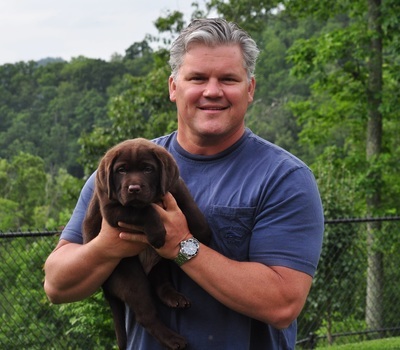 "If you are looking for the finest of English Labradors and an amazing, honest, breeder, English Mountain Labradors is the place for you. 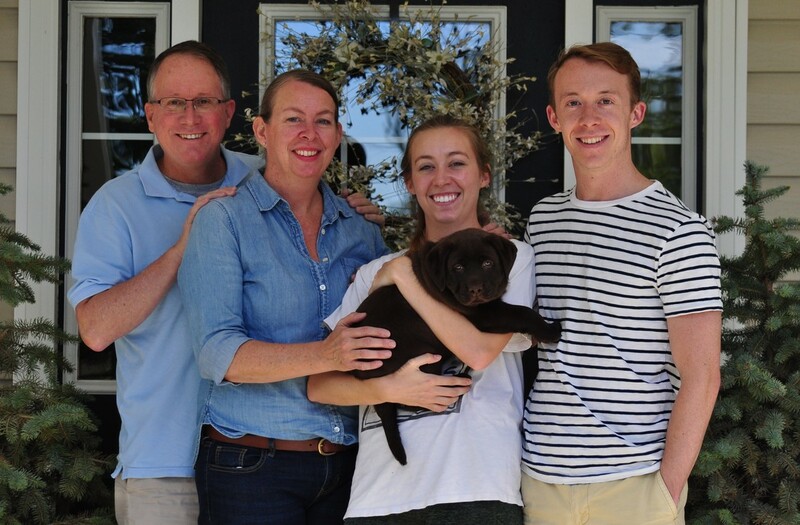 Kelly and family has provided our pup with the greatest loving, healthy, and clean place to enter the world, with a top notch mother. 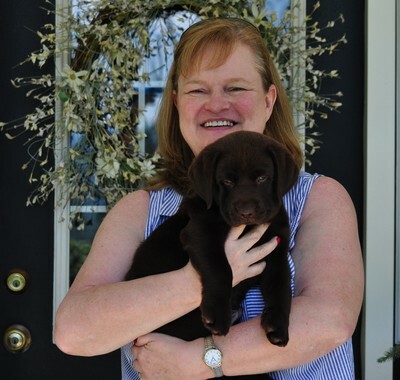 Kelly is a great communicator, and passionate about her dogs, kept me up to date with Nutella's development through emails and photo's. I loved her before I even met her. Thank you English Mountain Labradors!" "Wow", that pretty much describes our experience. From the first contact, Kelly was friendly and professional, explaining her application process and how her dogs were bred. Once chosen to be a puppy parent, we were kept up to date on the breeding process through emails and pictures of her beautiful dogs. She made sure we knew we were welcome anytime to visit the litter after they were born. We went to pick up our little bundle and we were greeted at the door by Kelly holding one of the most beautiful puppies we had ever laid our eyes on. She had a jet black, shiny coat and a tail that wagged a million times a minute. It was love at first sight. The kennel grounds were exceptionally clean, and you could tell all her dogs were loved and healthy. 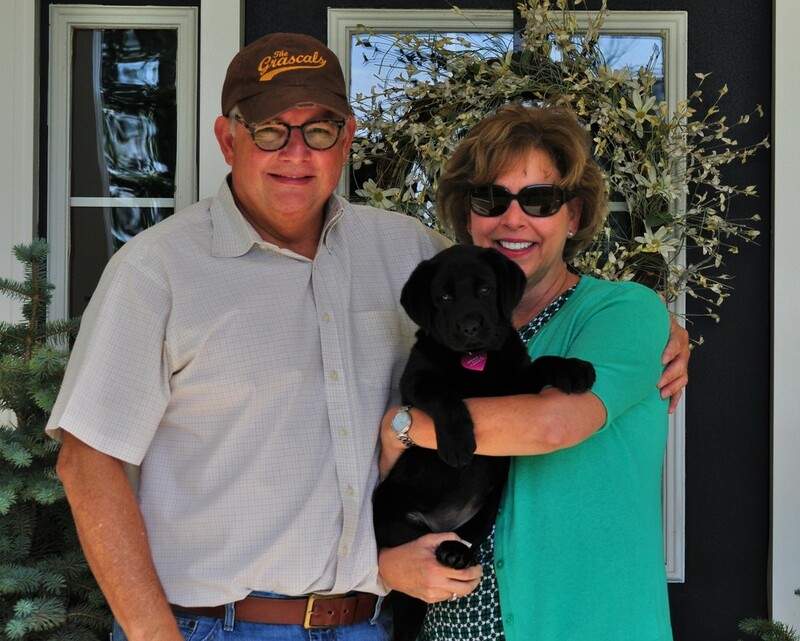 We definitely recommend English Mountain Labradors and Thank them for the new love of our lives, Masie!" went into rearing this litter." 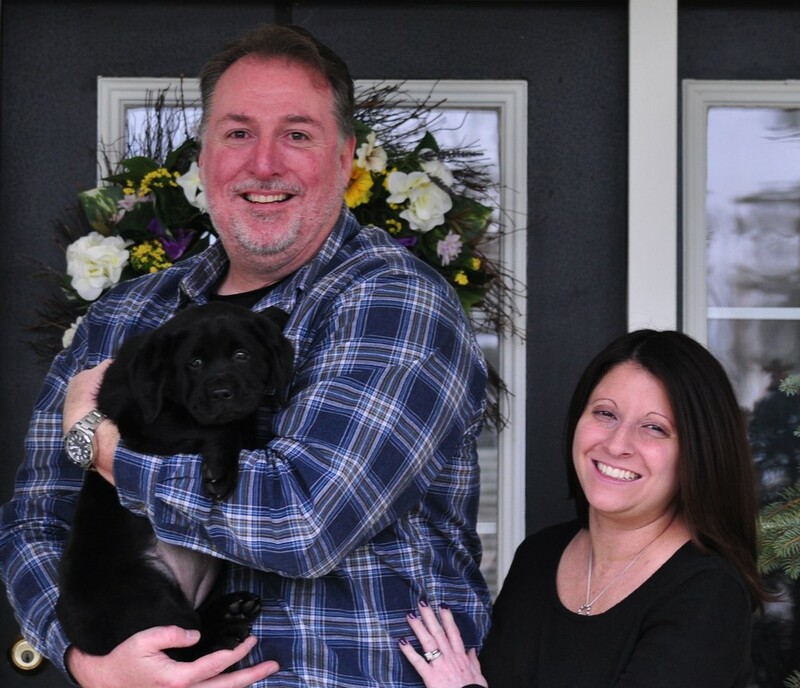 "We could not ask for a more amazing puppy and amazing breeder. 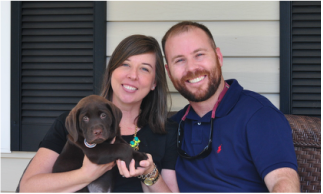 From day one we were walked through the entire process, step by step, knew what to expect and had our hundreds of questions answered by Kelly and her husband. They made us feel right at home from the beginning and gave us the puppy of our dreams. The experience was exactly what we were hoping for and we could not be happier with our beautiful Gabby. All the dogs at English Mountain Labradors are top of the line, beautiful and as happy as can be. 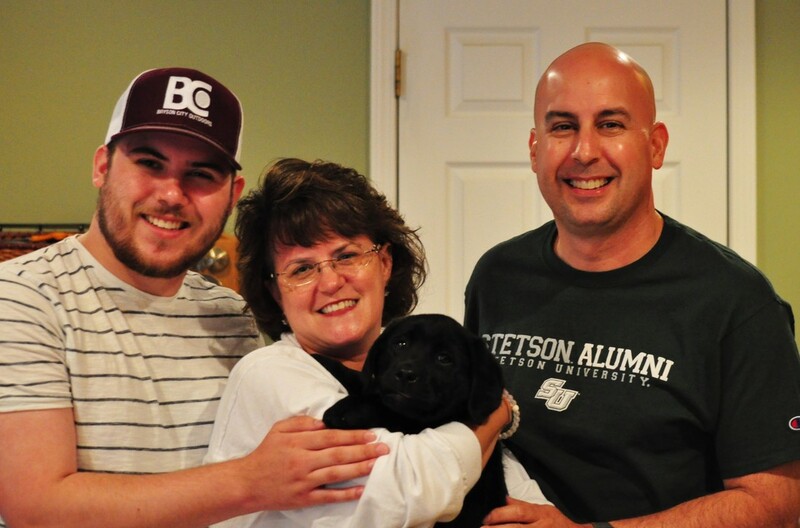 We didn't just get a puppy, we got a companion for life and good friends from the Simpson family. We can't recommend them enough. "Joe and I want to thank you, once again, how grateful we are to have 'Scout' in our home. She is learning new things each day and not far from being trained. So much of that comes from the wonderful start you gave her as her breeder. She was checked thoroughly by our vet the day after we brought her home and he was very impressed with her good health, "whistle clean ears", her beautiful coat, and of course, her beauty. 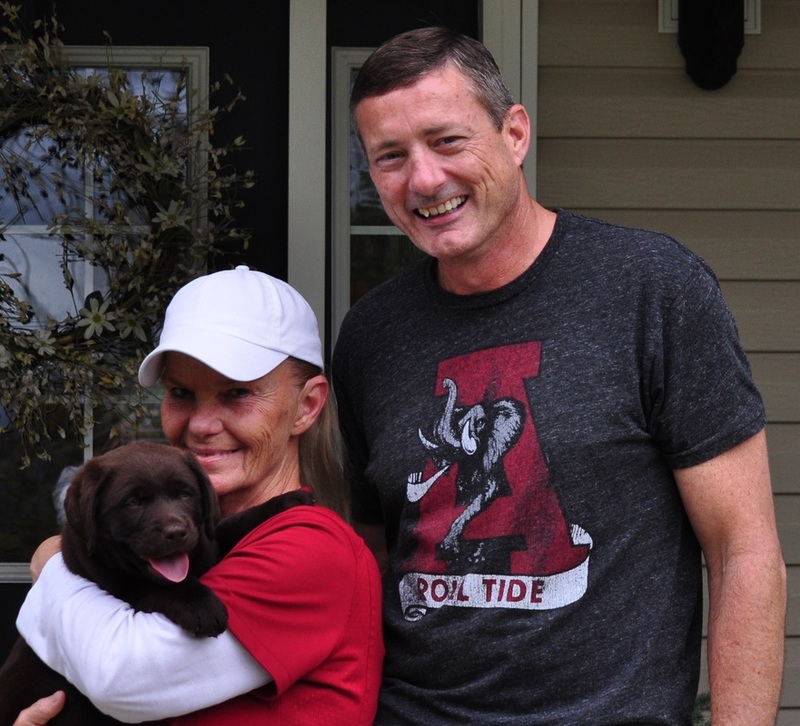 He asked who the breeder was and could understand why we drove from Indiana to Tennessee to get her. We picked you as the breeder we wanted after researching English Labradors. You kept us informed of her progress and sent lots of wonderful pictures during the eight weeks you had her. 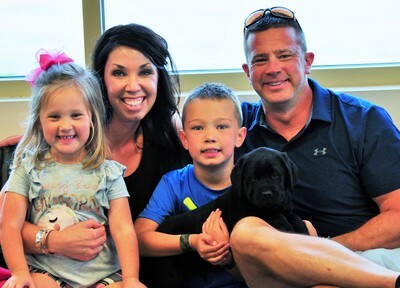 The best part is that you picked the dog for us from that litter that you thought best fit our circumstances in life as well as our personalities. We hope to visit you in the future for a second pup. Thanks again!!! "It is obvious that Kelly loves and cares for all her dogs. We couldn't be happier with our new puppy Kona, who is getting along fabulously with our existing English Labrador, Keiki." If you are looking for a true English style Labrador, I highly recommend them. "When we first spoke about getting a puppy from Kelly, she promised to stay in touch, send pictures, and she did all that including expressing her love for all the puppies. When we received the first picture of our puppy, she was only 5 days old. I printed the picture and made an oil painting of her. Her standards are unmatched to other breeders. Our first visit to the vet, you would have thought we came in with the Queen of England. The vet assistants and Doctor all wanted to hold 'Anna Marie' and love on her. We have never seen this much excitement with any of our other dogs. There are no words for what Kelly has done for Donna and me. She has truly blessed us with this puppy. 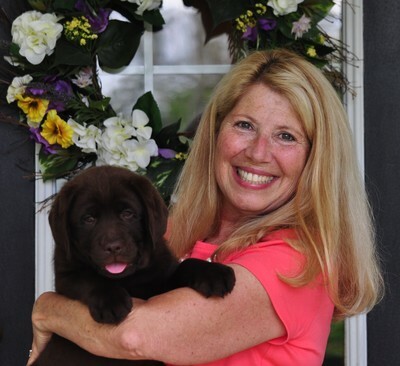 Anna Marie had us at woof and you had us at hello! 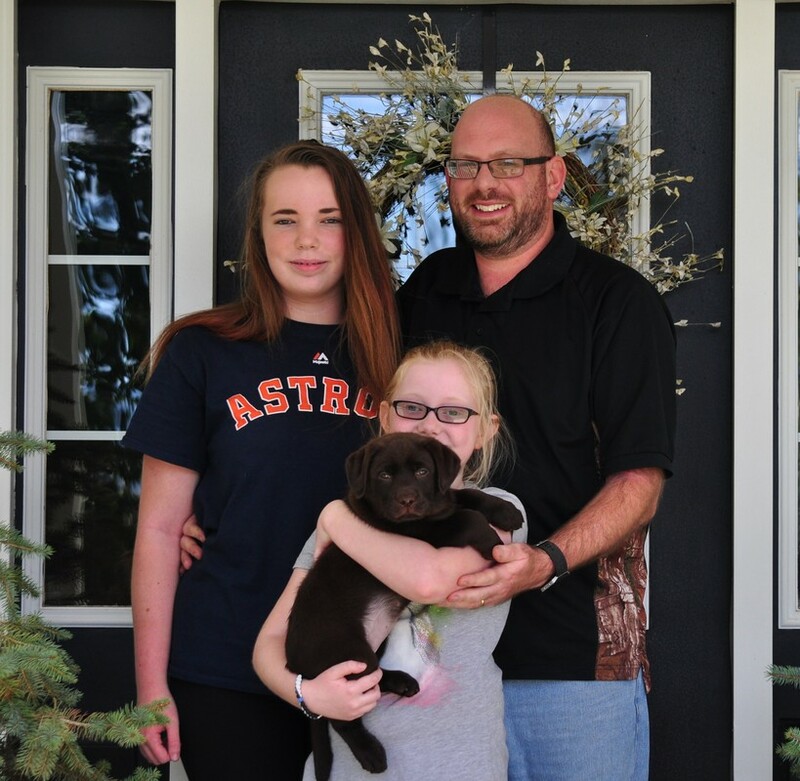 After losing our lab of 13 years, enough time had passed and we wanted another one. 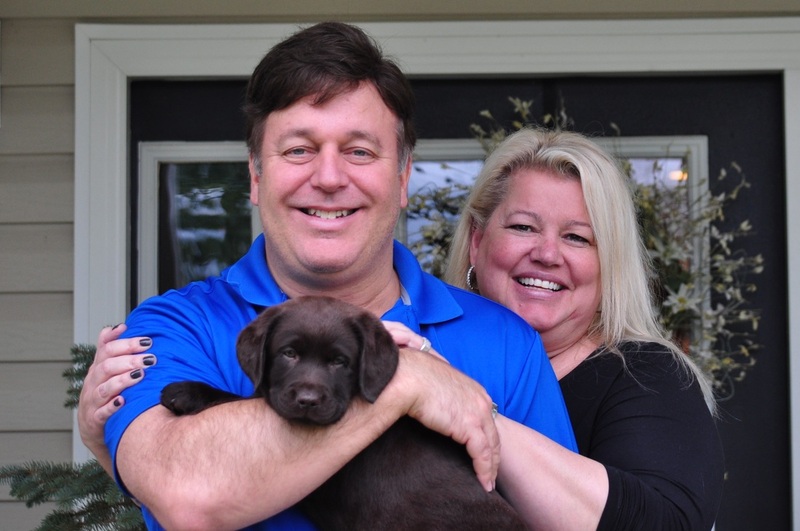 I searched the entire internet looking for the breeder who I thought had the perfect English Labrador. Upon finding Kelly and her family, I knew I had found the perfect one. 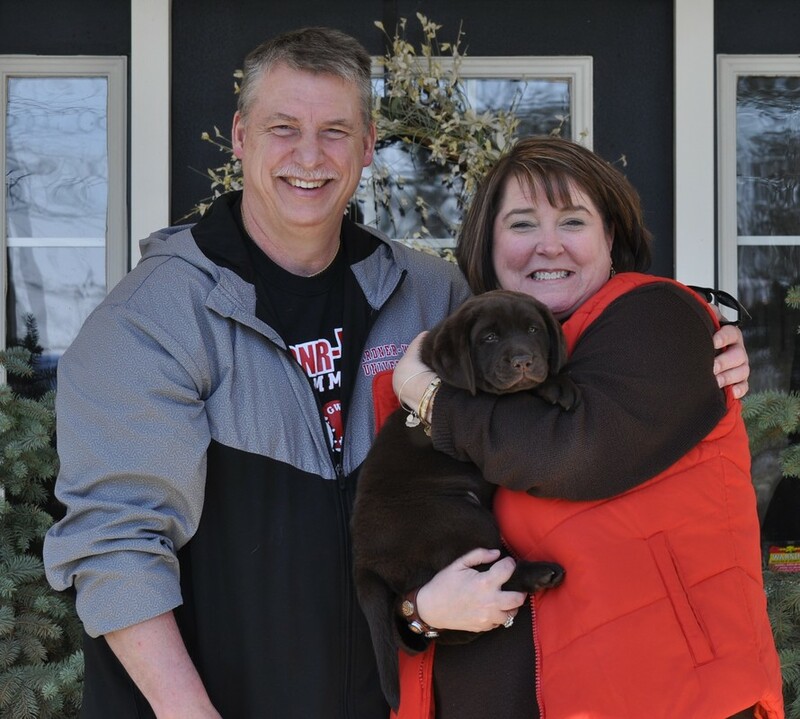 After many phone calls, emails, daily text/picture updates, and long months of anticipation, the day for us to pick up our new family member FINALLY arrived. When we arrived, we found beautiful, clean, well kept, and perfect environment to raise puppies in. Kelly is VERY passionate about her dogs and only wants the best for them. You will not find a cleaner or more loving environment. 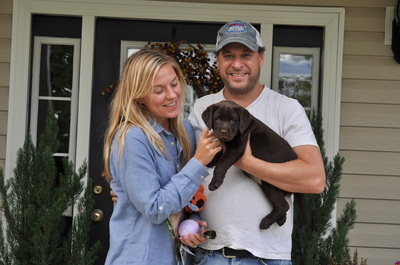 I would have driven anywhere in the country for our newest family member, Moose. 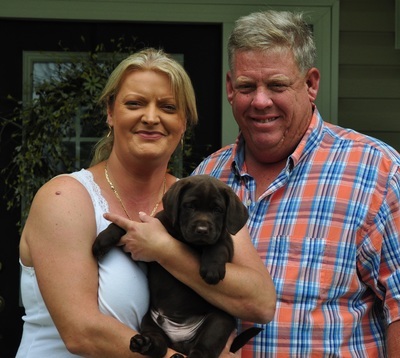 I chose Kelly because she was the premiere English Labrador breeder. Fortunately I came across your website quickly when I started looking for a breeder, and I was sure the search was over. After talking with you, I KNEW that English Mountain Labradors was the place for us. I never contacted anyone else before you, and it wasn't necessary after speaking with you because you are the loving, caring, trustworthy, and ethical person that I was hoping we would find. You genuinely love all of your dogs as family, and the love and attention that you provide for them, and for all the puppies is phenomenal! We appreciate the time that you put into keeping the puppy group up on FB, and love seeing all the pictures and get updates about all of the past and present fur babies. You go above and beyond for all of these beautiful babies and their families, and as far as we're concerned; YOU ARE THE BOMB! ​ Mitch and Becky White, Il. English Mountain Labradors. No photograph contained herein may be duplicated without our consent.